Be the first to share your favorite memory, photo or story of Robert. This memorial page is dedicated for family, friends and future generations to celebrate the life of their loved one. Robert Michael Dressel passed away February 3, 2019. Dad was born on May 17, 1938 in Spokane to Robert and Mildred Dressel. 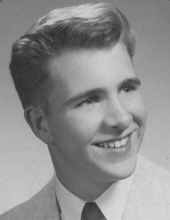 He graduated from North Central High School in 1956. While there, he met the love of his life, Delores McKinlay. After high school, Bob worked for the Milwaukee Railroad as a brakeman while also attending EWU. In college he studied finance, ROTC and boxing. In July 1960, Bob and Dee married. They soon started a family with two boys, Bob and Mike. The finance industry moved the family to various towns around the West but by the late 1960’s, the family was back in Spokane. One of Dad’s more interesting jobs was repossessing cars. He would hang out with his buddies, drinking beer until they thought the car owner was asleep. Then they would go repo the car. This job made for some good stories. Before long, Dad said he was too old to repo cars and he became a realtor. Later, he bought a bar called The Syndicate with his friend, Don. When it was sold, the name was changed to the Swinging Doors. Bob liked following politics and sports, camping with his boys and grandchildren (his favorite spot was Sullivan Creek), and most of all, taking his 1961 Olds out for a beer or two. Bob was preceded in death by his wife, Dee in 2015; his son, Mike in 2013; and his parents. He is survived by his son, Bob (Audrey); and his grandchildren, Melissa, Robert, Sammy and Mike. The family would like to thank the staff at Avalon Care Center for their help over the last 15 months. Viewing will be held February 7th from 10:00 to 5:00 at Heritage Funeral Home. A graveside service will be held February 8th at 2:00 at Greenwood Memorial Terrace 211 N. Government Way. To send flowers or a remembrance gift to the family of Robert Michael "Bob" Dressel, please visit our Tribute Store. "Email Address" would like to share the life celebration of Robert Michael "Bob" Dressel. Click on the "link" to go to share a favorite memory or leave a condolence message for the family.